Scabies is a very uncomfortable, contagious skin condition commonly seen in children and young adults. 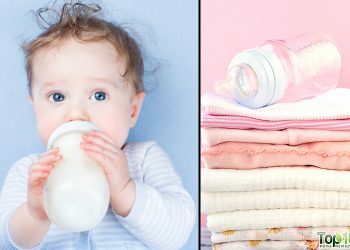 It can spread quickly among people in crowded conditions who have direct contact with each other, such as in child care centers and nursing homes. It is caused by a mite, known as Sarcoptes Scabiei, which can survive up to a month living on human skin. Scabies generally appear on the shoulder blades, buttocks, under the breasts, soles of the feet, around the waist, between the fingers, on the knees, around the genital area, near the elbow and in the armpits. Common symptoms of scabies include intense pain, itching, rashes and redness around the infected area. There can be swelling and blisters, too. The mites spread to others through close contact with an infected person, sharing personal items belonging to an infected person and sexual contact with a person who has an infestation. Prompt treatment is essential to reduce the symptoms of scabies. There are over-the-counter as well as prescription medicines for scabies. 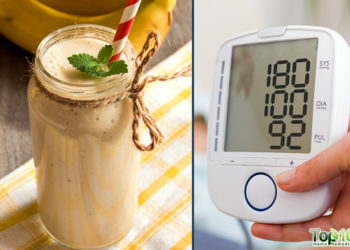 However, you can start treatment at home by trying some simple natural remedies that use readily available ingredients. 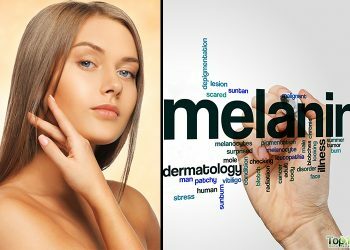 The simplest way to soothe scabies itching and other symptoms is to soak the affected area in cool water for 10 minutes, pat dry your skin with a clean towel and then apply some calamine lotion, which you can buy from the market without a prescription. Alternatively, you can place a washcloth soaked in cool water on their irritated skin and then apply some calamine lotion. Do this several times a day. 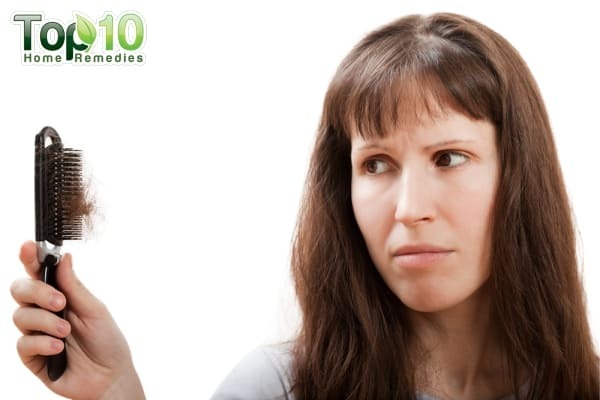 Here are the top 10 home remedies for scabies. 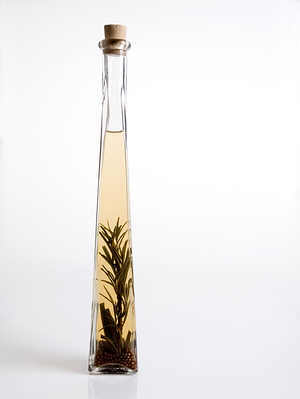 Tea tree oil contains a compound called terpinen-4-ol that helps kill the parasite that causes scabies. Also, the anti-inflammatory, disinfectant, antiseptic, antiparasitic, antibacterial, antifungal and wound-healing qualities of tea tree oil help treat scabies. Mix one tablespoon each of tea tree oil and olive oil. Use a cotton ball to apply the solution on the affected area. Do this twice daily for two to three weeks. It will help decrease swelling and pain while speeding up the healing process. Alternatively, add 10 to 12 drops of pure tea tree oil to a bathtub of lukewarm water. Take a bath in this water twice daily for a few weeks. Note: Pregnant women and nursing mothers should avoid using tea tree oil. Also, tea tree oil can irritate sensitive skin. If you have sensitive skin, test the treatment on a small area first. Neem oil is a botanical pesticide used to treat many skin problems including scabies. It contains antibacterial and antifungal properties that help eliminate bacteria and fungus trapped in the skin. 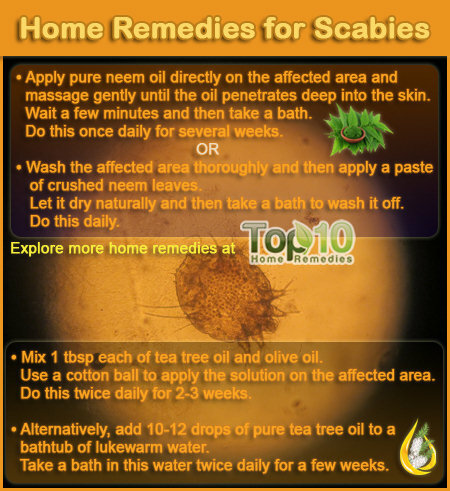 The smell of neem oil prevents scabies from reproducing, which can greatly shorten the duration of the problem. Apply pure neem oil directly on the affected area and massage gently until the oil penetrates deep into the skin. Wait a few minutes and then take a bath. Do this once daily for several weeks to prevent the infection from spreading. Make an antiseptic cream by combining two ounces each of neem oil with an equal amount of freshly ground turmeric powder. Apply the cream on the affected area two or three times a day. This homemade cream helps soothe itching and speeds up the healing process. Neem leaves can also be used to cure scabies due to their antibacterial and antifungal properties. Neem leaves help reduce itching and can clear the mites within only a few days. Make a paste out of a handful of fresh neem leaves by crushing them with a pestle and mortar. Wash the affected area thoroughly and then apply the neem paste. Let it dry naturally and then take a bath to wash it off. Do this daily to speed up the healing process. Boil some neem leaves in a cup of water. Let it cool to room temperature. Drink one tablespoon of the liquid three or four times a day. Repeat this for a week or two to make sure the mites and scabies are gone completely. Cayenne pepper will burn and kill the mites, thereby relieving the problem of scabies. Mix one cup of cayenne pepper in hot bath water. Soak in the bath water until the water gets cold. Be sure not to get the water in your eyes, as the pepper will cause a burning sensation. Rinse off the cayenne pepper with cool water. Repeat once daily until the scabies is treated. Note: This remedy should not be used by people with sensitive skin. Zinc will not directly treat scabies, but it will greatly help prevent fungal outbreaks and fight off secondary skin infections. Grind two or three zinc tablets into a fine powder. Add a little water to make a thick paste. You can also add a little bit of turmeric to make it more effective. Apply the paste on the affected skin. Leave it on for at least half an hour or until it dries naturally. Repeat once daily until the scabies infection is gone. At the same time, eat more foods rich in zinc like sunflower seeds, whole grain products, wheat bran, soybeans, and others. Turmeric is a wonder herb with antiseptic and anti-inflammatory properties that can greatly relieve the symptoms of scabies. Mix one tablespoon of turmeric powder and a few drops of lemon juice and water to make a thick paste. Apply the paste on the affected skin and leave it on for about an hour. Then rinse it off with lukewarm water. Do this once daily until you notice significant improvement. Mix one teaspoon each of turmeric and neem powder. Add some water to form a smooth paste. Dab the paste on the affected areas and let it dry on its own. After it has dried, take a bath or shower to wash it off. Repeat this once daily. 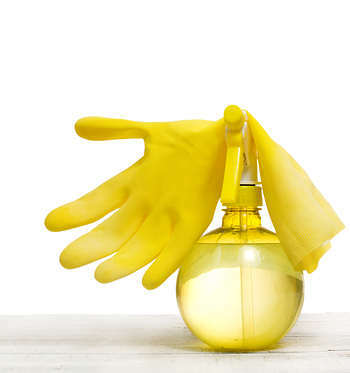 The acidic nature of white vinegar changes the pH level of the skin. It has been found that any change in the pH level causes mites to die. Mix equal amounts of white vinegar and water thoroughly in a bowl. Using a cotton ball, apply the solution on the affected skin. Leave it on for a few minutes. Then rinse it off with lukewarm water. Repeat three times daily for 10 to 15 days to fight the infection completely. Aloe vera has antimicrobial properties and many natural medicinal properties that can speed up the healing process of scabies, insect bites and many other skin conditions. 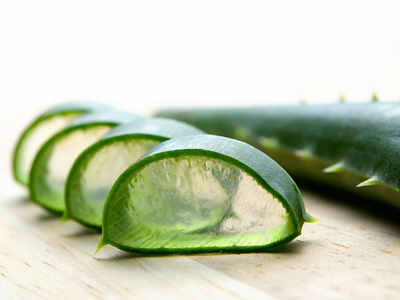 Apply fresh aloe vera gel on the affected skin. Leave it on for half an hour and then rinse it off with lukewarm water. Repeat two or three times daily for a few weeks until you notice improvement. Grind a handful of calendula petals along with a pinch of turmeric powder. Add two tablespoons of aloe vera gel and mix it in well. Apply the paste on the affected skin and let it dry on its own. Do this twice daily for a few weeks for complete recovery. 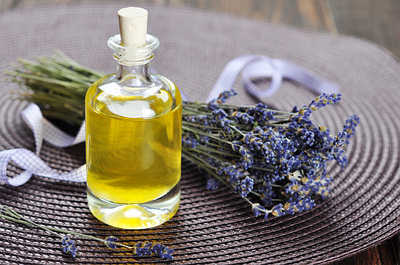 Pure lavender oil promotes skin cell regeneration and kills parasites like mites that cause scabies. Add five drops of pure lavender oil to warm bath water. Soak in this bath water for at least 15 minutes. This will help soothe the skin and provide some relief from the itching. Do this once daily for a few weeks. Mix equal amounts of pure lavender oil and rubbing alcohol. Apply it on the affected area and massage gently so that it penetrates and saturates the skin. This will help kill the mites and their eggs. Do this twice daily to speed up the healing process. Bleach is another popular home remedy for scabies as it helps kill mites. Mix together one part of bleach and four parts of water. Spray this solution on the affected area twice daily. Along with these remedies, it is very important to avoid contact with an infected person and his or her personal items. Also, keep the surrounding area neat and clean to prevent the mites and scabies from spreading. Thanks for neem remedy I will use it till it completely be cured. Scarbist can be cure Using papaya leaves crushed or marsh it with a mortar make it soft extract the juice and apply it on the affected area. I have really suffered with my whole family scrubbing our body everyday now its months I have prayed cried mostly for my little boy who is suffering for real please help me. am from a poor family I just want home remedies. thenkyou. You can also get fresh neem leaves, make its paste, mix this paste in coconut oil and boil this mixture for few minutes till the water( in neem paste gets dried) Apply this mixture daily on your body everyday after bath.Do this also for a month. 23 months?, I have been dealing with this for 4 and I am going nuts….I have lost so much sleep because of the burning and itching. It has crippled my emotional well being. I have used the scrips and still suffering, just when I think they are gone, they are back….I have washed everything in hot water, I will try some of these home remedies, and pray they work. I have almost every oil you have listed, and never thought to come here..Thank you, wish me luck. I love to help people when I can.And if you have or know someone with scabies,”I can help”!!! I’m lower income and have contracted scabies more Times than can be counted cleaning public buildings,restaurants etc.Seems if I go to a doctor i need a weeks pay to pay for his 1/2hr.Why I don’t know,but I never have any luck with them,their stuff never works or they are completely misdiagnosing it or missing the point all together. So I just don’t go much anymore.I’m bright,old farm boy,x military spec.forces.Hunter, trapper,woodsman and there isn’t much I can’t deal with on my own. So if I tell you something helps,you can count on it.Here we go.First,stop the itch for every one in your house immediately. So you can all focus and calm down,nerves don’t help the itch at all.And do it quick before someone runs out a 2nd.story window screaming!How? Like this,it will cost almost a dollar per person! You will need 1 box 8oz.baking soda,1heaping teaspoon vasoline petroleum jelly,and two cups liquid soy bean vegetable oil.Soy works the best it retards insects capabilities. Now draw hottest bath you can stand with 8oz.baking soda mixed in say 5 inches deep max.Hot water opens skin pores wide so baking soda can get in easily and as deep as possible.Baking soda does several things,it eventually will help easy itching,cleans wounds by neutralizing acidic trash the insects create and creates a ph shock wave that really beats the mites up.Soak and scrub with mild soap for a half hour.They put up a good fight so you need to ware them down a little! Now drain tub and towel off.You should already have your vasoline,1heaped teaspoon melted and mixed with 2 cups liquid soy bean vegetable oil.Draw the same temperature bath with same amount of water and no baking soda this time,instead ,get in sit down and pour in the oil mixture and be very careful when you get out.Soak for an hour or so and constantly rub the floating oil all over your body from face to bottom of feet while sitting.Hot water opens skin pores,and thins the oil so it penetrates deep into skin where it does several things.hydrates the skin incredibly,you will look way younger.It smothers the mites by plumbing cells and closing off pores in your skin and theirs.And most importantly,it dissolves mite waste and toxins that are only dissolved and neutralized evidently by oil.”DO NOT WASH IT OFF WITH SOAP”!!! Get out carefully and just keep toweling it off until you are dry but a little oily to the touch.At that moment in time you will notice that you don’t have a itch in the world.Now go to bed and sleep peacefully for the first time since this mess began.In the morning was well and use your permetherin or what ever.I use dog flea and tick shampoo. Pl. apply paste of NEEM Tree leaves (made by crushing Neem Leaf and water) on affected part of body.Let it remain for sometime and then wash. Take SAFI-Indian neem extract medicine- daily two spoonful twice a day, one hour after Lunch and Dinner. Soak the Neem leaves in a bucketful of water overnight and bathing twice a day for child. OK.
Cayenne Pepper bath will make the “sensitive skin” of the scrotum burn — just be prepared for that mentally. The cool water rinse will be a relief…..
Twenty-five years ago I had my first encounter with scabies. It was a horrible and long tern battle that probably scarred my psych forever with respect to these things. Without a doubt, exposure to these insidious parasites is not an indication of a person’s hygiene, they can happen to anyone! But having them makes you itch uncontrollably at night when you are trying to sleep and forever makes you feel dirty and untouchable. I managed to get some Quell (Lindane based) lotion, which is what was prescribed at the time, and it never completely killed all of the scabies. These things develop a resistance to poisons over time. In doing much research, I found that Elimite (5% Permethrin) was the latest weapon in the fight to kill the mite and convinced a doctor to prescribe it. I used it very carefully, cleaned everything, and it worked. That was twenty-five years ago! I recently came home from a short road trip, where I obviously picked up the dreaded scabies, from an off brand hotel. I will forever til the end of the time, pay the extra for at least a known chain hotel or one rated in review, to avoid something like this ever happening again. Knowing immediately what I had contracted, I asked my doctor for two tubes of 5% Permethrin, for my wife and I, who was not with me on the my road trip and showed no symptoms, thanks! We both coated ourselves in the lotion, from chin to toe. Scabies are not supposed to get onto your face or in your hair. We washed and dried ALL of our dirty clothes and bedding on the highest heats, and sprayed chairs, steering wheels, couches, tub, mattress, and shoes with lysol, which is always a step when using these things. I felt better for a few days and then the beast where definitely back four days later. We went through the same steps a second time and they once again came back! This is hell. I bought a bar of 10% Sulphur Soap, and bathed with it, leaving it on my skin each day for three days and that did not work. I tried soaking in a half cup of bleach per full bath of hot water for three days and that did not work. I bought a quart of 10% Permethrin for plants, mixed it to a 7% solution with some lotion, used it, and that did not work. The 5% or 7% Permethrin should work, but scabies obviously develop a resistance to it. Double hell. Finally after much more research, I found a possible remedy not prescribed and another prescribed, that I suggested to my doctor. I bought a bag of Diatomaceous Earth, food grade. You can get it at hardware stores or health food stores. I powdered myself with this talcum powder like substance from chin to toe, rubbed it in good, and immediately got relief from the mites from hell. Once again we went through the whole cycle of lysol and washing all clothes and bedding. A day later we got a prescription for Ivermectin, an internal prescription medicine, second line doctor’s defense against scabies, and took it. Once again, I informed the doctor about this from research. Most doctors don’t know about this stuff. I now think I’ve defeated them. I continue to use the Diatomaceous Earth each morning after I bathe, still using the sulphur soap, three mornings now. The Ivermectin was a one shot deal. They seem to be dying, the itching continues but is getting better each day. You have to put the Diatomaceous Earth on when you are totally dry, and I have continued to apply it to hot spots during the day. 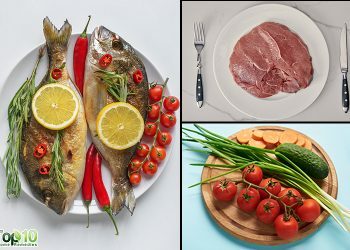 It is a microscopic mineral particle, that in food grade form, you can eat, but it will dissolve in water and become ineffective against mites. It also works against bed bugs. It physically destroys the exoskeleton of insects, and they cannot develop a resistance to it. I do think the Diatomaceous Earth is very effective by itself, but you use everything you’ve got. Many other things that I tried may work for others, each bug is different, but this has been MY ordeal. After contacting these horrible, horrible creatures. My son and I have used everything the doctors prescribed and nothing worked. I did a little digging on my own and discovered (the first time) that by mixing 7-dust and Equate body moisturizing cream, making a paste works very well on calming itch and killings mites. That was about 3 months ago. Just last week I started running very high fevers and noticed the same itchy feeling I had had earlier. I immediately went to my 1st remedy, it calmed the itching, but not like before. I have Neem oil that I purchased from Asian store it helps but not sure if it is killing the things or not. I have sprayed more cans of RID and Lysol till I am sick of smelling them. Washed everything in the house like they tell you to do. Whatever you do, don’t take the Cheyenne pepper bath. I used about 1/4 cup of Cheyenne pepper and probably stayed in the tub 20 minutes at the most. When I got out I was burning from the inside out. I sat in a tub of cold water twice, took a cold shower and it still did not stop the burning sensation. Although, I must say I’m no longer itching. I use kerosine oil on my finger and it easy the itching and venigar as well. Let the kerosine oil soak for about 20 mins and wash hands. After using Ivermectin and Permethrin for 5 months and spend a lot of money I finally figured out something much cheaper and efficient. Sulfur ointment 10%. You have to apply it in your whole body for 3 consecutive nights. You can buy it on Walgreens or Walmart without a doctor´s prescription. You will spend around 12 dollars for the whole treatment. Vinegar is also very effective. I also recommend Tea tree oil. Remember to put your sheets, blankets, pillows in the drying machine every day. And also put your clothes in the drying machine BEFORE to wash your clothes in the washing machine.